General Yo - Ladies and Gentlemen of the Jury, I Present Exhibit M10! 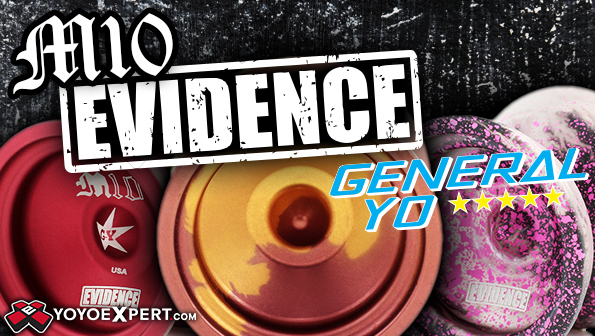 Back in early 2014, a shipment of the brand new General Yo M10 was sent to YoYoExpert headquarters, but they never arrived. They were stolen. The tracking info showed that the package had been delivered to our building's mail center and after a few weeks of searching we discovered some of the yoyos being sold on eBay. So we contacted police, explained the situation, and before we knew it our yo-yos were wrapped up as key evidence in a court case. It took 2 whole years, but the case is finally closed! The evidence has been released back to us and we added a fresh new engraving to help tell the story. This is the General Yo M10 EVIDENCE! The M10 is a competitive yo-yo players dream. It has a rim heavy weight distribution and wide stance that gives this yo-yo a rock stable feel in play and powerful spin off the throw. With the angled yet comfortable profile, the M10 moves as fast as you can push it and the bumped gap gives you that extra edge in horizontal play. Finished with the signature General Yo blast and some cool engravings! This release may be a couple years late, but if you like a good story with your yo-yo you won't find a better one than the M10 EVIDENCE! *NOTE: Splash Editions come with a Grooved Bearing // Solid & Comp Editions come with a Flat AIGR Bearing. We wanted to come up with a discounted high end throw, without the discounted look and performance. Our competition grade is the same stuff as the a grades, with a little less time into the testing and tuning. Not as smooth as an a grade, but still darn smooth.